Immerse yourself in paradise at our tranquil completely restored vintage beach cottage. We're located in Puako, the only beachfront community on the Kohala coast on the Big Island of Hawaii. Puako was an ancient fishing village and is now known for its green sea turtles, colorful tropical fish and spectacular sunsets. If you're vacationing during the winter months, watch for the humpback whales that return every year to romp and play. The weather here is sunny year-round. There's easy access to ocean beaches, ancient petroglyphs, spectacular golf courses, shopping, world-class resorts and fine dining. 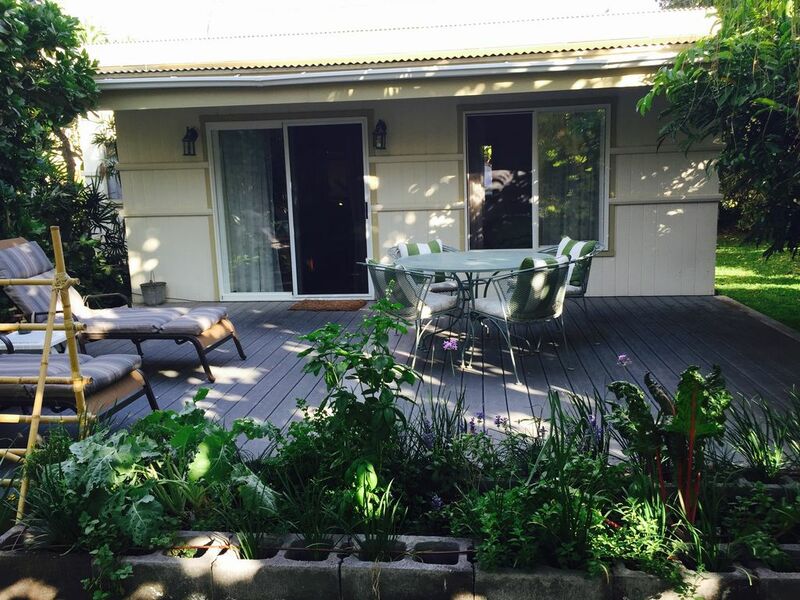 Private parking and entry to property, surrounded by lush greenery and private yard setting. 2 bedrooms (2 Queen-sized beds) View Photos. The second bedroom is shared with the open living area which makes a comfortable living space. and the cottage has a hard wire to the router.. WiFi works ! NOTE: Air Conditioning Upgrade, cottage now has AC for your comfort, ,,,,and is included for your stay but please be conservative and turn AC off when out and about , use the AC as needed,,,,Enjoy a beach bike Cruz,,,(when available) got a couple of beach bikes , you can kick it down to the beach of over to the resort for pupu's and a drink or for sunset or,or, or! My wife and I thoroughly enjoyed our stay in the beach cottage. We have rented may properties over the years and this one stands out for having top quality amenities. The seating is very comfortable, kitchenware is plentiful and of good quality, appliances are good (including the the BBQ), there is lots of beach equipment to use and most important; the bedding is in good shape and very comfortable. The cottage was spotlessly clean when we arrived and we immediately felt at home. David is a great host. He provides plenty of privacy but is right there if you need him. The location is also good. A nice lava beach for sunsets and turtle watching across the quiet road and Hapuna beach is 10 minutes up the road. The area is very quiet at night and great for star gazing. We were sad to leave and will definitely be back! We really enjoyed our stay at the beach cottage in Puako. The cottage has everything necessary to relax and be comfortable. Sunny lanai out front and cool lanai with fan in the back. Nice that there are 3 tables with chairs so you can enjoy eating wherever you choose. Loved being able to walk to the tidal pools each evening for sunset. Puako road is great for walking, biking, running ...right from the cottage! All the Big Island beaches are within a short driving distance. We recommend this place if Puako is where you want to stay! Vintage cottage is in lovely Puako. If you are not familiar with Puako it is a quiet town right on the ocean and near some of the best beaches. Cottage is very comfortable and well equipped. Owners are extremely nice and earth conscious as we are. We have been coming to the Big Island for years and have stayed at many place and this is right at the top. Beyond our expectations. Surrounded by a beautiful garden, walking distance to turtle pools and some of the best snorkeling on the island. The hosts were full of information about the locale and the wildlife IF you wanted to contact them. Otherwise, you’re on your own with beach gear, bicycles, outdoor shower, towels and private secure parking. Well equipped kitchen, front and back porches, crisp television and a lovely chorus of birds each morning. What a perfect little cottage. Beautifully decorated with truly comfortable furniture and beds. The kitchen has everything you could want or need. Loved breakfasting on the patio with the birds. Dave was a consummate host. Attentive, but not invasive. Easy walks down the road to the many beach access points--each a little different than the next. All perfect for watching the setting sun. One of the nicest places we've stayed. Mahalo! Cozy, clean and well supplied. Very nice cottage and extraordinarily well supplied. Host greeted us then left us completely alone until our departure. Approximate to quiet lava shoreline beaches. Puako is the only ocean side residential community on the Kohala Coast. It is still a well kept secret of original cottages and large estate homes nestled on the coastline where all of the major 5 star resorts have been built. Small beaches and petroglyph field within walking distance. Sheltered reef for snorkeling, shore diving, swimming, under water photography. NOTE: Cottage now has Air Conditioning for your comfort ,,for an additional fee of $30.00 a night, you may decide at any time to add the AC,,,, , Rates for the cottage are subject to change until time of booking!